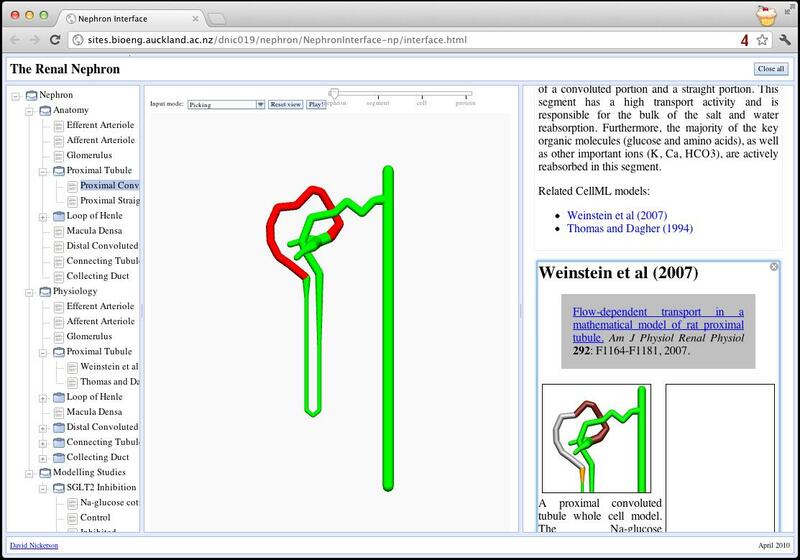 A demonstration renal nephron model interface. Under the VPR kidney project we are extending earlier work to present comprehensive web-based descriptions of our computational modeling of the nephron. Our earlier work is described in the article: A tool for multi-scale modelling of the renal nephron by David P. Nickerson, Jonna R. Terkildsen, Kirk L. Hamilton and Peter J. Hunter . The interface presented in this article has now been updated to make use of newer technologies that have enabled the interface work across a wide range of web-browsers and operating systems. To make full use of the updated interface, users must first install the Zinc plugin (version 0.7 or higher). The updated interface is available here.